Do you want a career in which you make other people’s dreams come true? Read here to learn how to become a wedding organizer and be your own boss. Starting your own company is a dream many people have for their future. How great would it be to escape your mundane job and be your own boss? In fact, over 50% of the population wants to become their own boss. So, how do you go about doing this? There are so many avenues you could choose in the quest to be your own boss. If you value organization and love romance, consider becoming a wedding organizer. A wedding organizer works to bring their client’s dream wedding to life while staying within their budget. The job requires amazing people skills, budging knowledge, organizational skills, and detailed planning. If you’re interested in becoming a wedding organizer, keep reading to discover how you can do this. One of the reasons being a wedding organizer is so great, is that it doesn’t require a whole lot of education. While many wedding organizers have obtained a Bachelor’s degree in hospitality, marketing, business, or public relations, this is not necessary (although a business degree might help when trying to open your own business). Wedding planning certifications are also available. These offer a quick and cost-effective way to gain knowledge of wedding planning, although many times they are not required to start working. Consider learning about floral design and cake design as well. While you won’t be doing this part yourself, you’ll need to help couples pick them out, so having some knowledge on what makes a good floral arrangement or cake design can go a long way when making suggestions. Of course, you don’t need to take courses in this if you don’t want. The internet is loaded with valuable information. Whether you decide to go for a Bachelor’s degree, certification, or neither, it’s a good idea to start your wedding organizer career by working for a company. Before starting to venture out into the world of being a business owner, you should familiarize yourself with the industry. While working under a boss isn’t your end goal, it’s a great way to learn the ins and outs of your new field, and you’ll gain valuable skills and advice that can help you with your own business. It’s important that you are confident in your ability to be the lead in planning and executing a wedding before trying to open your own business. Being a wedding planner is all about organization, and starting your own business is no different. Take the time to consider every aspect of your future business and read about how others have started their wedding organizing business as well. Consider taking some business classes. They can help you decide on your wedding planner logo, create your business model, outline your budget, and promote your new business. Decide what services you’ll offer. Will you take on destination weddings and complete wedding organizing services or will you just stick with the day-of coordination? Once you’ve made all the proper plans for your new wedding organizer business, it’s time to put it into effect. There are a few things you’ll need right off the bat. Make a portfolio of all your work. This is where you can really showcase some of the most beautiful and well-planned weddings you’ve done in your career. Consider including a variety of styles in your portfolio. Not every couple is traditional, so while is definitely important that you include examples of traditional weddings you’ve design, you should also include any weddings that were unique. Otherwise, untraditional couples might feel like you aren’t able to pull off their dream wedding. Hire someone to create a professional website. Many times, your website is the first impression potential clients have, so it should speak to who you are as a wedding organizer and make them want to choose you. Advertising is extremely important to get your first clients. You can use social media, printed materials, and the radio to get your word out. Be sure to have tons of printed materials, including business cards, flyers, and brochures. Carry your business cards around with you at all times (you never know who’ll meet throughout the day) and hang flyers around town advertising your services. Don’t wait for your clients to come to you. Consider going to them by attending bridal expos and bridal shows to meet some potential clients. Word-of-mouth is an extremely powerful tool in the wedding planning industry. Being the newbie in the industry will mean that your biggest competition (companies who’ve been in the biz for a while) probably have word-of-mouth on their side. While it might be tempting to pick up every client you get, be sure to pace yourself. If you overwhelm yourself by taking on too many clients at once, you might not be able to produce your best work, and you’ll risk facing negative word-of-mouth which can be detrimental to new wedding organizers. Remember: you don’t have all the resources you had when you worked for a big company, either. Take on a modest number of clients and give them your full attention. And, most importantly, be sure to give them the wedding of their dreams. 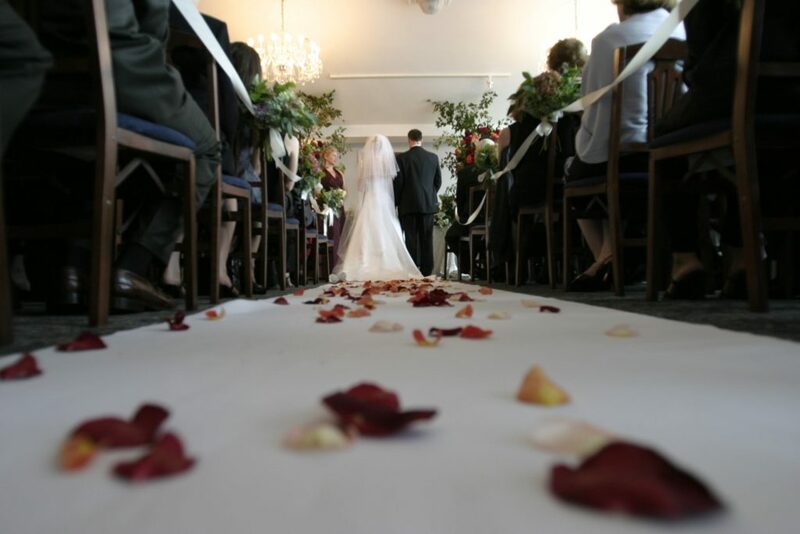 Becoming a wedding organizer is a dream for many romantics out there. What better job could there be than helping others plan the wedding of their dreams? Additionally, many wedding organizers find success being their own boss. If this is your goal, then be sure to educate yourself, gain experience and take the time to plan your business before taking the plunge. Once you’re prepared, you can start your own business, advertise, and start planning weddings! Did you like what you read? Check out our blog’s business page for more great articles like this.